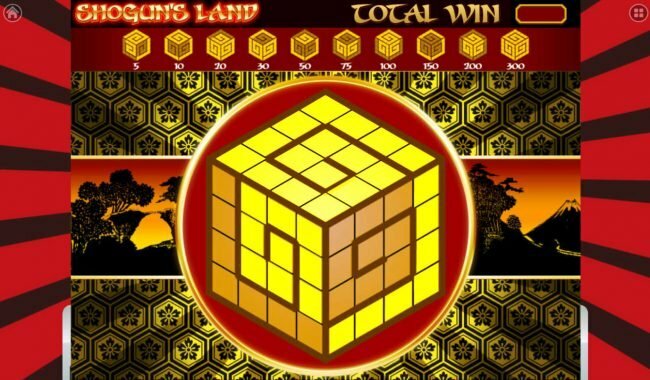 Shogun's Land slot machine derived on the Japanese martial arts concept with 20 lines and 5 reels from Habanero. 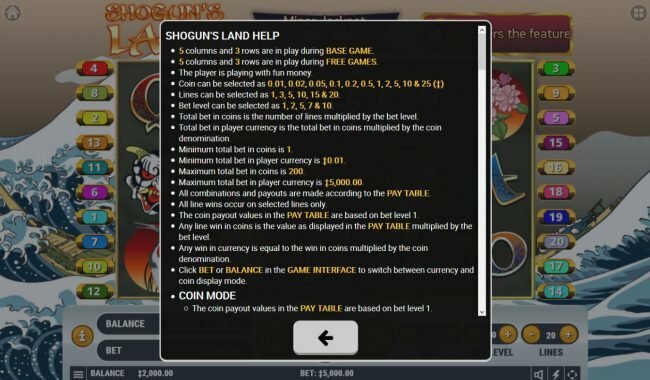 Shogun's Land Slots has not been reviewed yet, be the first to rate this slot. 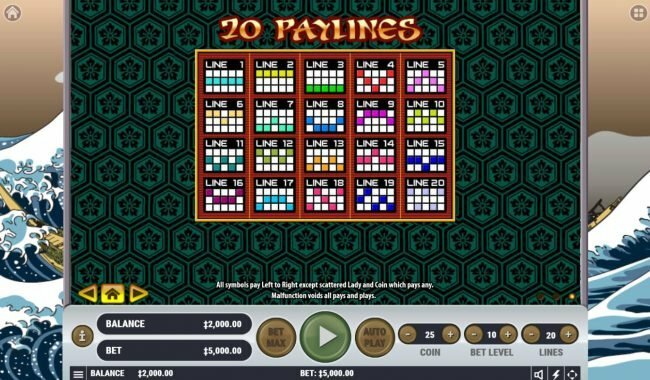 When creating a review for an online video slot machine such as Shogun&apos;s Land, we have to examine many things. Mainly we take note that there are 20 pay-lines along with 5 reels. 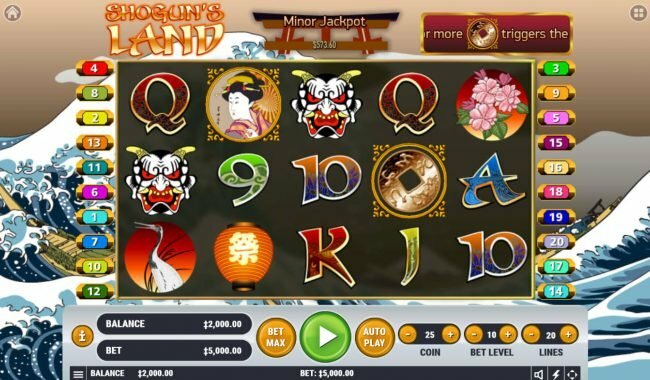 To my joy this Japanese martial arts themed slot delivers a ton of enjoyment by incorporating symbols such as mask, lantern, sumo wrestler, egret and pink flower. 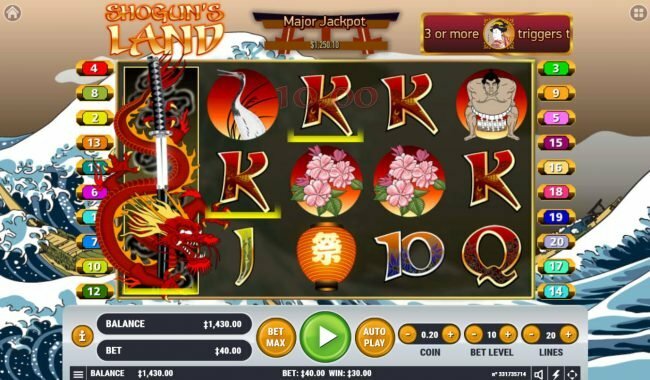 Additionally you will see ace, king, queen, jack, ten and nine raising the level of experience of this great Japanese martial arts online slot machine. 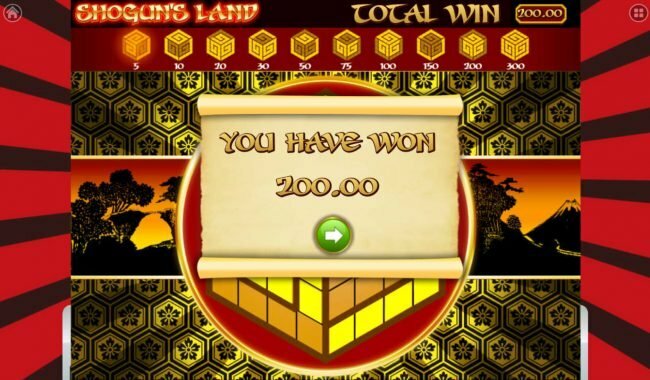 Offering game coin values from $0.01 to the max of $5000, you can be sure to get into your ideal teir on Shogun&apos;s Land. Try to have many dragon wild icons to acquire an insane win. 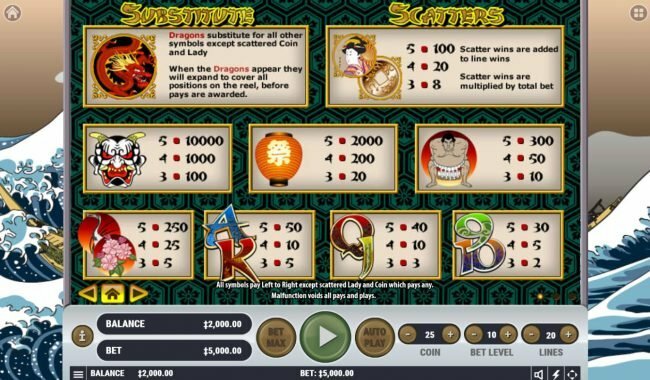 Take note that the scatter symbol used on Shogun&apos;s Land are a geisha and gold coin, these symbols pay out when you have multiples on the video slot. The unique geisha and gold coin images are not needing to be on the same payline to activate. Its bad when at the start of your spin when your starting reels don&apos;t match up but there is always an opening of still winning with scatters. 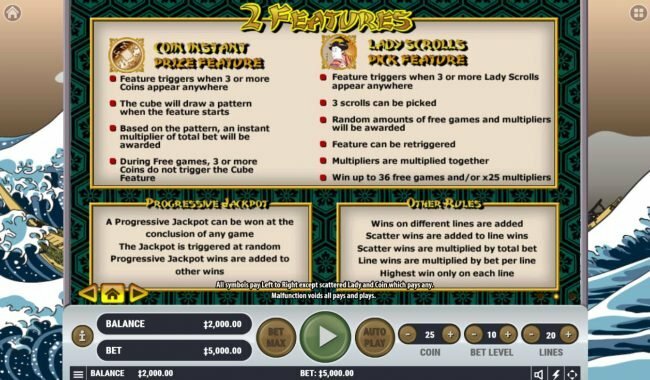 Slots such as Golden Unicorn, Flying High and Mr. Bling are very much alike. 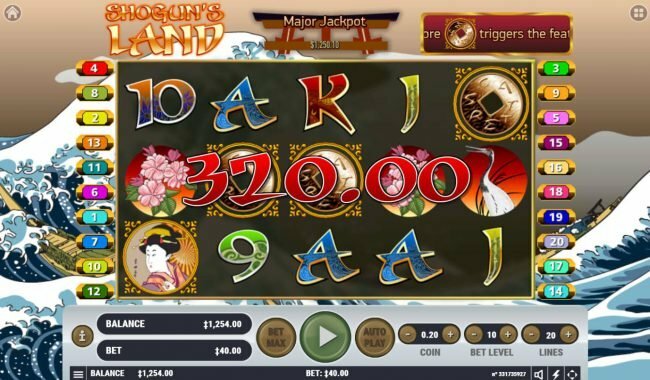 Shogun&apos;s Land is a good Slot Machine, the Japanese martial arts design was well thought out and the game play is exciting. Some other games like Cash Reef share a lot of the identical design. 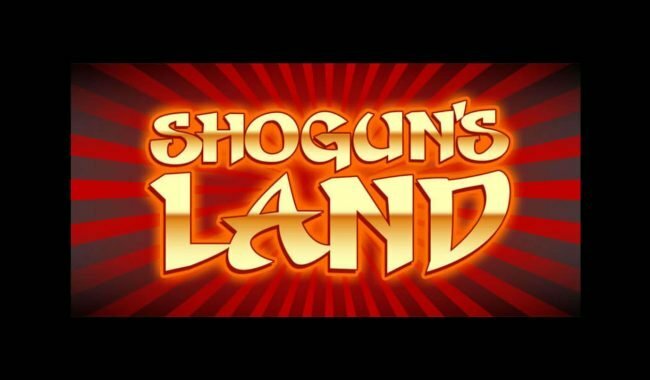 To sum the review we say that Shogun&apos;s Land remains a good game with average wins and graphics. The bonus round piece of Shogun&apos;s Land is really cool. Here are the details on the Bonuses you are able to win. 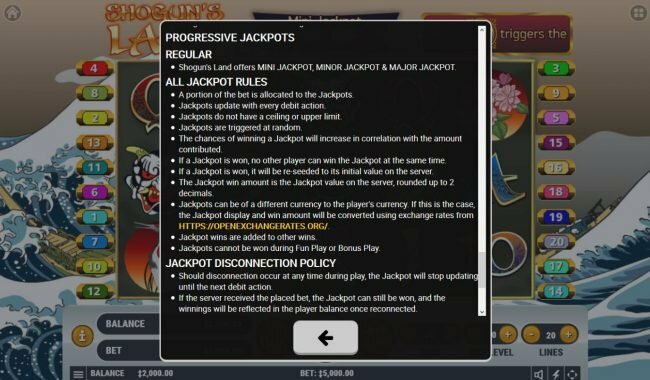 If you appreciate huge pay outs, the Coin Instant Prize Feature will not let you down. Simply get three or more coin symbols appearing anywhere to launch. A Lady Scrolls Pick Feature is begun once you achieve three or more geisha symbols appearing anywhere, this Bonus game in my findings appears to produce not as well as other Slots. I am pretty sure you know that like all features, the Shogun&apos;s Land feature allows a chance to get your credits on the positive. 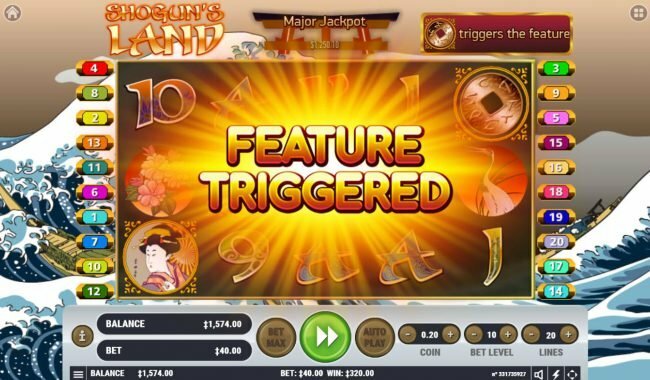 Slot features add a ton of diversity to video Online Slot Machines, you will find that this is the best piece of Shogun&apos;s Land.